There's actually way too much candy and sweets in my house this month already but Crystal Spin Casino's new Sugar Rush slot game is a sweet Christmas treat -- with no calories! lol It's a 5-reel, 20-line video slot loaded with mouth watering candies. 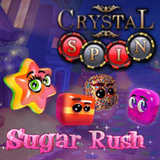 On Sugar Rush you can bet from $.01 to $5.00 per line. Gingerbread Men are Wild. Three Cupcakes wins up to 9000 bonus points. Three or more Gummy Bears wins up to twenty free spins. The Candyland Bonus Game is a super sweet treat where players can win up to 9000 bonus points by building candy castles. If you're new to Crystal spin you can take advantage of one of the largest Welcome Bonuses anywhere – 350% up to $3,333 on first deposits then 250% and 200% on second and third deposits. They'll also make you feel at home through daily New Player Tournaments (1:00 pm - 7:00 pm EST). Every day the top five new players receive a $100 cashable chip and the next five get a 500% deposit bonus.